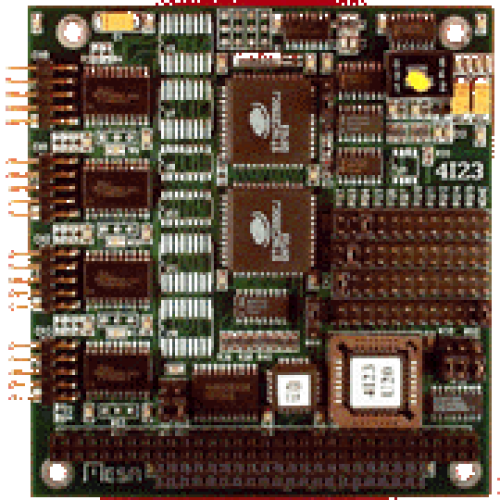 The 4I23 is a low cost, four channel serial port card on a stackable PC/104 bus card. The 4I23 is available in three versions: quad RS-232, quad RS-422, and a model with two RS-232 and two RS-422 channels. The 4I23 uses 16C550 type FIFO'ed UART's. These UART's have built-in 16 byte receive and transmit FIFO's. The 16 character FIFO's reduce interrupt overhead and allow higher data rates without losing characters. The receive FIFO's also increase the allowable interrupt latency. This is especially important when using programs like WINDOWS that disable interrupts for comparatively long periods of time. 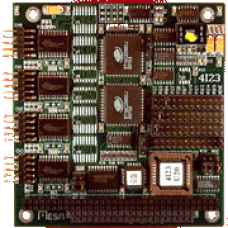 Unlike many serial cards, the 4I23 is implemented with the 16 bit bus connector so that each of the four serial ports on the 4I23 can use any of the 11 available AT bus interrupts. The 4I23 also has an shared interrupt capability. The four serial port interrupts can be logically or'ed to a common interrupt. The or'ed interrupts are individually maskable. The interrupt status of all four channels is readable at a single port location to allow quick response to the shared interrupt. All additional I/O necessary to implement the shared interrupt logic uses aliased addresses so that no extra I/O port locations are required. The RS-422 ports have one handshake-in and one handshake-out line. The RS-422 drivers can be software enabled and disabled for bus (RS-485) type applications. Jumper selectable RS-422 termination is provided on card. Serial port connectors are 10 pin headers that match 9 pin AT type serial port pinout when terminated with an IDC type 9 pin subminiature D connector. Serial port addresses are set with a PAL device. Eight different sets of port locations can be selected by option jumpers. The 4I23 requires only +5V for operation, as all RS-232 power is generated on card. All CMOS technology keeps power dissipation to a minimum.